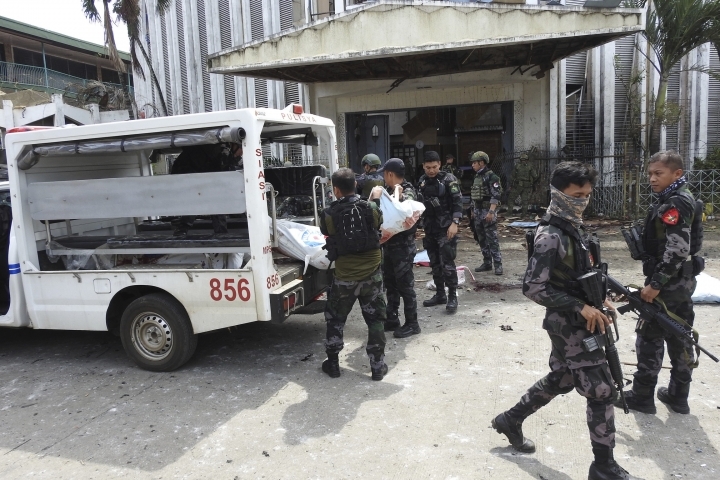 MANILA, Philippines — An Abu Sayyaf militant leader accused of plotting a recent suicide attack in a Roman Catholic cathedral in the southern Philippines may be harboring a foreign would-be suicide bomber in his jungle base, a senior official said Thursday. Interior Secretary Eduardo Ano said Abu Sayyaf commander Hatib Hajan Sawadjaan, who allegedly plotted the Jan. 27 attack at Our Lady of Mount Carmel Cathedral on Jolo island that killed 23 people, was also behind a suicide attack last year that killed 11 people in nearby Basilan province. Sawadjaan's goal was to assert his new role as Islamic State group leader in the southern Philippines, Ano said. Ano said in an interview that government forces have received intelligence about the presence of an Arabic man in Sawadjaan's camp in the jungles of Sulu province's Patikul town, and are taking steps to capture him along with Sawadjaan and his men. "We're watching this man because he's also a trained bomber and a (would-be) suicide bomber," Ano said. He said the militant could be a Yemeni or an Egyptian national and has married a local villager. Ano, a former military chief of staff who as interior secretary supervises the national police, provided more details about Sawadjaan, a low-key Muslim insurgent in his 60s who he said was recognized last year by the Islamic State group as its lead representative in the country's south, although IS also regards three other local militant factions as allies. "The bombing of the cathedral and the bombing of Basilan were Sawadjaan's moves to assert leadership," Ano said. 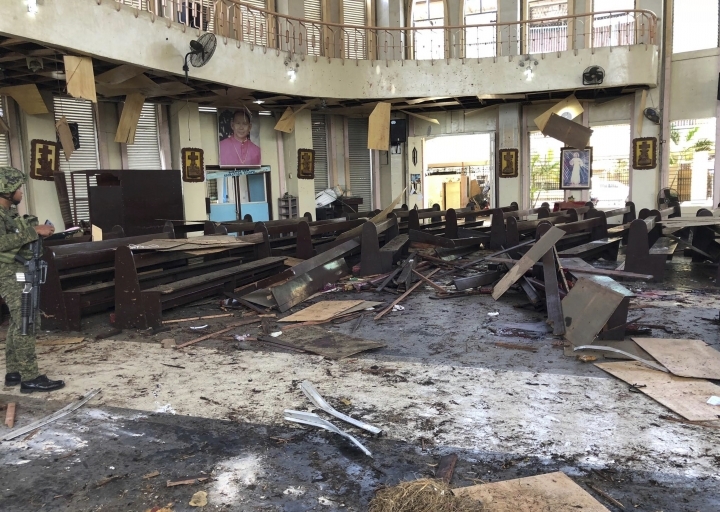 Police have said the Abu Sayyaf staged the cathedral bombing to gain attention and possible funding from the Islamic State group. Police said the foreign militant had targeted a gathering of about 2,000 mostly students and teachers in Basilan's Lamitan city but his vehicle stalled and villagers whom he asked for help became suspicious when they saw wires protruding from plastic gallon containers in the vehicle. The vehicle exploded as troops approached. Ano said the militant, who used the nom de guerre Abu Kathir Al-Maghrib, had stayed in Sawadjaan's camp in Jolo before he traveled to Basilan. Both the Basilan and Jolo attacks were delayed because of funding problems, he said. "That Moroccan lived in the camp of Sawadjaan. He was seen by hostages," Ano said. 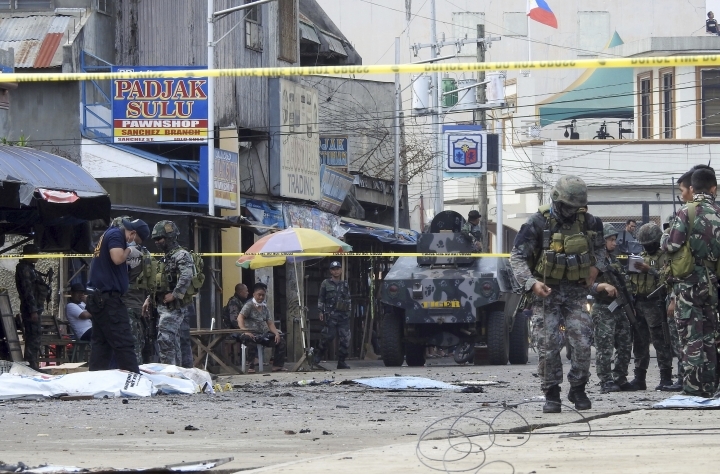 An Indonesian militant who allegedly carried out the cathedral attack stayed in Sawadjaan's stronghold for a while and arranged for his wife to travel to Jolo to help carry out the bombing, Ano said. The Jolo and Basilan bombs were made of similar explosives and most likely were assembled by a foreign militant, he said.